I'm not crazy about thin crust pizza but by the looks of this pizza, who wouldn't want to divulge into this goodness? 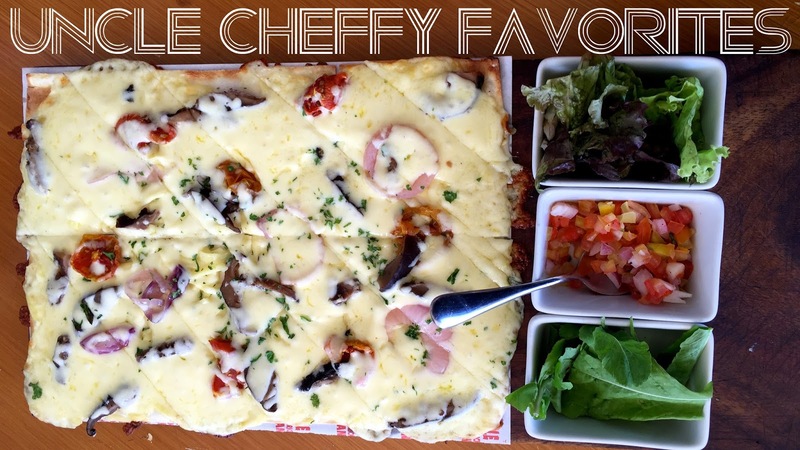 Uncle Cheffy Favorites: Oven dried tomatoes, mushroom garlic, anchovy, chili flakes, basic and 3 cheese. Uncle Cheffy, you had me at 3 cheese. In Sky Ranch Tagaytay, it's actually Uncle Cheffy / Kuse. 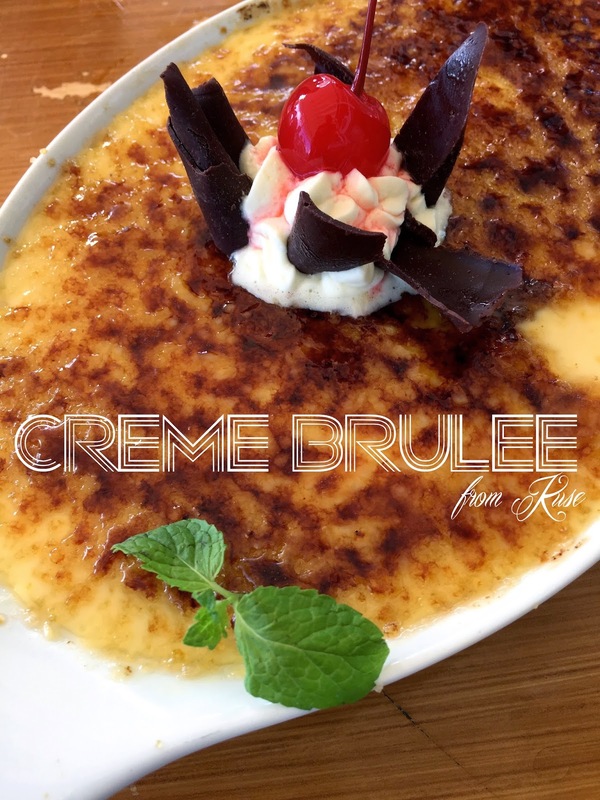 Kuse is more of the traditional Filipino cuisine but we just ordered this delicious Sweet Potato Creme Brulee. I don't remember having tried potato and cream together - mainly because I don't really eat potato; but this turned out to be a really good combination. The gang decided to have dinner at my aunt's friend's restaurant. Unfortunately for me, these are the only photos of the restaurant I have. It's a newly opened restaurant named La Finca. 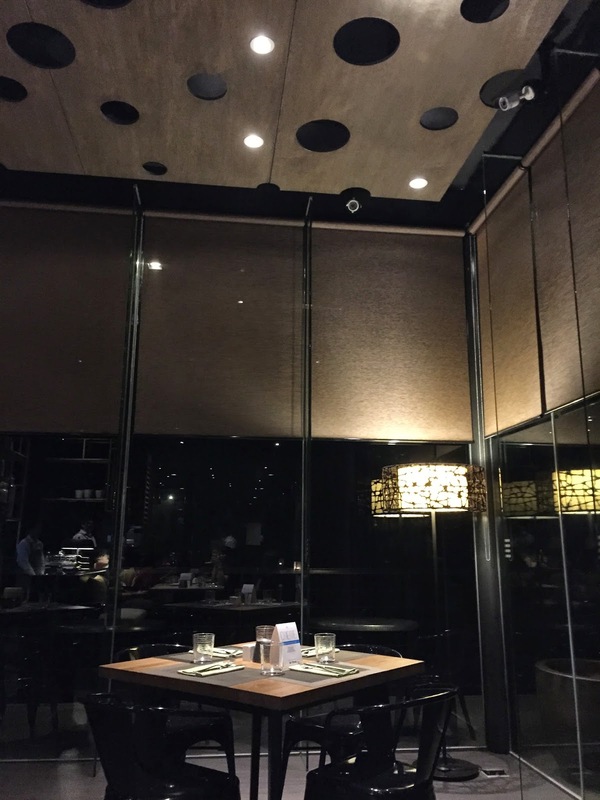 I haven't established the whole theme of the restaurant but judging by its ambiance, it seems very Western. They don't have a website/Facebook yet (or maybe I just can't find one), but they also serve breakfast dishes and Filipino. La Finca is located at Joaquin's Bed & Breakfast. 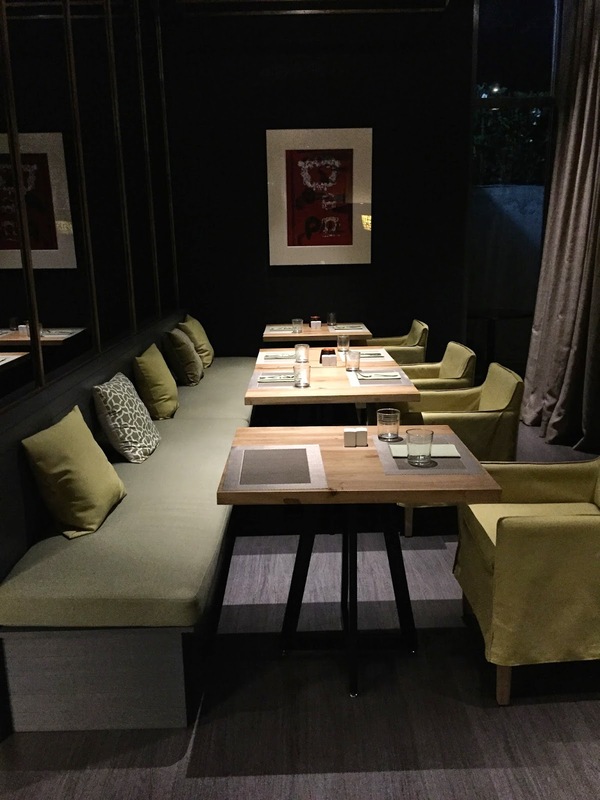 It is the restaurant of the hotel. The whole place is really pretty. The architect/s of the place did a really great job. I believe I'm coming back to this place some time in the future. First of all, I'm not a bread person. You will never see me eat the side bread of my pasta, steak, or whatever. But I love this type of bread. I cannot mention the name or type of bread since I am not very knowledgeable with bread. Nevertheless, I think I had requested for 5 more of this since I love how it compliments the butter, and vice versa. Like I've mentioned above, they do serve Filipino food. If I'm not mistaken, they called their Caldereta something like Batangas Caldereta - but I am very uncertain. Judging by the photo, the serving's not that big. 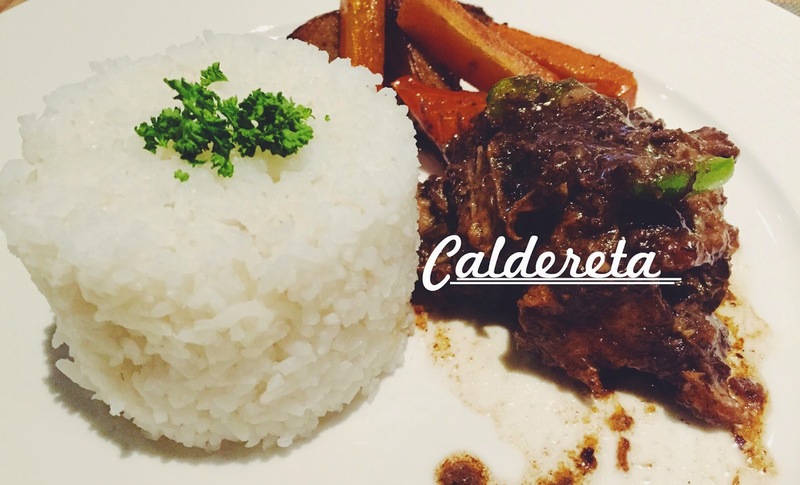 I was told by the head waiter that their Caldereta used to be a part of the to-share menu, but after a few suggestions, they put it into the solo meals. In my opinion, they should have stuck to the to-share menu. For its price (P525), I think anyone who orders this deserves at least 1 more piece of meat. Although I would like to commend this dish's taste - it was superb. The beef was very tender and it was very very tasty. My mom ordered Banana Cake since she's on (serious) fasting and abstinence. I tried it too, and the cream cheese really added up to its delish flavor. 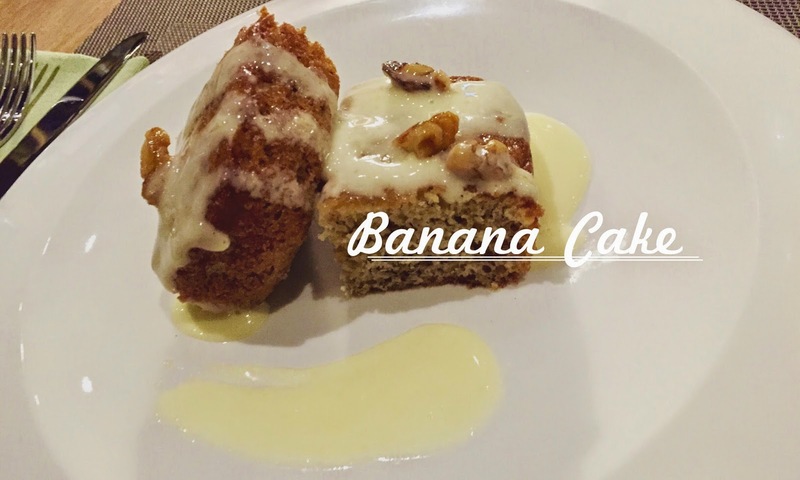 I'm not being biased, but I still like my mom's version of Banana Cake more. I wasn't able to take photos of their order (because I think it's actually rude), but I was able to taste the Sinigang and and Bagnet. The Sinigang's taste was perfect. It was spicy and sour - two things I look forward to. The Bagnet, on the other hand, was very innovative. Bonding on the side, yesterday was perfect.